You don’t need a lot of expensive equipment or bulky tackle boxes. Be sure to check our suggested basic tackle section of the What To Bring list. For your convenience, we maintain a good selection of productive lures in the correct sizes and colors for the specific lakes of your route. These are adjusted weekly, as the season changes, based on reported fishing activity. Additionally, live bait (night crawlers and ribbon leeches) is highly recommended. Northern Pike are probably the most aggressive fish in the north country. They hunt for food in the morning and evening … this is the time to work creek mouths and narrow entrances to bays. Try surface lures. During midday, troll shorelines with medium to deep running plugs and spoons. Run your lure about halfway between the surface and the bottom. More on fishing for Northerns here. 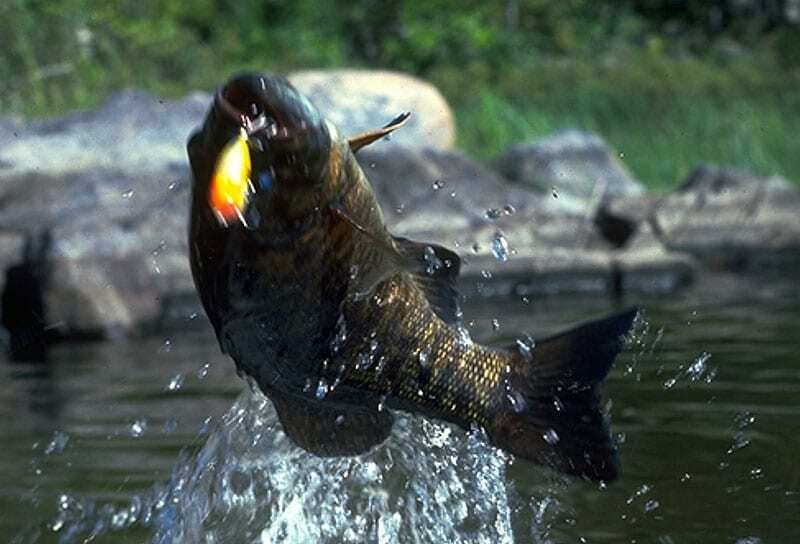 Smallmouth Bass are pound for pound the toughest fighter in the north country. Worms, frogs, minnows, and crayfish are on the primary menu for bronze backs. Bass usually strike from below their target, so run a little shallower with your lures. Topwaters are (by far) the best for morning and evening if the water is flat. Midday, bass are not very active, but trolling a minnow-like lure in 8-12 feet of water will sometimes induce a strike. More on Bass fishing here. Walleye are one of the finest tasting game fish in North America. Males get up to the 2 pound (+) size, and females can grow to as much as 12 pounds in our cool northern waters. In spring, fish the breaklines or around gentle rapids, using a jig and leech, or dead-slow with a minnow-like lure. In fact, if you fish the current below rapids, don’t retrieve at all. Keep lifting the rod tip and let the current do the work. More on fishing for Walleye here. Remember: fish are a renewable resource … there’s no problem as long as everyone plays by the rules and lets nothing go to waste. Keep some to eat … Put the rest back for someone else to enjoy!